One you learn to ride a bicycle, you never forget. 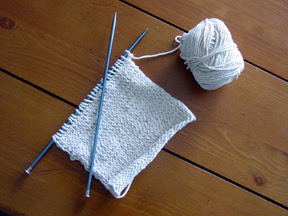 I picked up my knitting needles for the first time in nearly 30 years this past weekend. I say, it is like visiting an old friend! I stumbled for a little bit and got confused by the knitting book I bought (to teach myself again) and then I discovered the reason why I was so confused was because I knit using the Continental method (because I was taught by my German mother and grandmother) and not the English method. My book is geared towards the English method. I sat down again after all the kiddies went to bed and I just started to knit like I had never put the needles down...I guess once you learn to ride a bicycle, you never forget! I got my Loom Knitting Primer book written by Isela Phelps the other day and I am very pleased with my purchase. I would highly recommend this book to any newcomer to the art of loom knitting. It is a very comprehensive book which I will no doubt be carrying around in my loom knitting bag for many months to come! Prior to receiving my copy, I had been unable to find a book with such indepth illustrations and instructions. If you need a jumpstart on your loom knitting confidence, this is the book to buy! I just can't give up on my dream of knitting gloves on a loom so I am at it again. This time I am trying to do the whole project on a single loom. I am working on the pattern for the one loom mittens and I am hoping to apply this technique to my glove pattern. So far the blue Knifty Knitter loom is way too big for my hand, but that is just logistics, I can always go to one of my smaller and finer looms once I have the concept down. I am keeping my fingers crossed on this one. I just can't seem to get the idea out of my head that it can be done! Tip: use twisty ties for thrifty method of marking your loom to help you keep track of either decreases or increases in your loom knitting projects. I know, I know, you are going to start thinking I have stock in the Twisty Tie Corp, but I don't, I just have lots of them on hand and they work so well since they are easily bent and lightweight. I am throwing in the towel on my loom knit glove with fingers! I have been unsuccessfully trying to create a pair of gloves using just my looms and have not had any luck. I am able to get fingers on my handpiece but there are giant holes at the base of the fingers I am unable to blend into the rest of the stitches to make it look like one fluid piece. I was able to get fingers attached, but without a smooth transition, it just will not work! I even tossed my last attempt into the trash and a few hours later my husband discovered it in the trash, rescued it and brought it to me asking if our baby (Amanda May who is one year old) took it and threw it away (bless his heart). I told him I was just too frustrated and that I couldn't even figure out how to get the dumb thing unwound to salvage the yarn! More bad news today. I just read an email from my friend Sheila who was diagnosed with and treated for cancer a few years ago, she had blood work done this past weekend and the test came back way off, her readings should be around 35 or less and she had readings of 6400! She told me that she believes it may be a mistake since she does not have any symptoms, however, she asked me to keep her in my prayers. This is very disheartening news for me and my family, she has been a wonderful blessing to us first as a nanny to our children, then as a cherished friend, and most recently as a valued spiritual adviser. I will most certainly keep you in my prayers, Sheila! I got two fingers of my glove on the hand piece, only three to go (yeah!). The thumb piece doesn't look the greatest, but once I get the other fingers on, I'll rip the thumb piece out and try something else. Here I thought the thumb would be easy! Ha! I'm cookin' with gas now! I am making some progress on my glove. 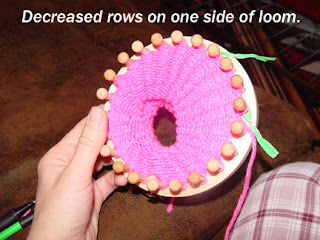 I posed the question to my Loom Knitting group over at Yahoo.com and got an idea I am working on. Can't say yet if it will work since I just started it and only got the wrist part done so far. I found this over on Isela's blog and thought I'd give it a shot. I have been told on numerous occasions that I looked like Gena Davis, but this picture obviously didn't pick up on that resemblance. Rip it, rip it, rip it...I hear lots of frogs around here. Well, I have frogged the glove again! I was doing so good and my one year old came along and yanked on the yarn and messed everything up! She was so darn cute, I couldn't be upset. She just stood there and giggled. I am working on adding a sunrise design to the glove using the Russian join method and using different colored yarns. I wish I had taken a picture because it looked so good. Now, if I can remember how I did it and replicate it, everything will be great! 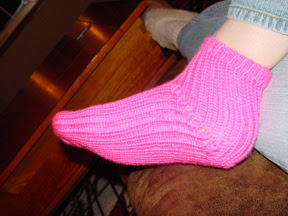 I started working on my socks. Ohhh, are they ever fun! I could get addicted to those. So fun, I want to work on the socks and leave the glove idea alone for awhile. I suppose it's ok, it isn't like I am on a deadline or something, this is a hobby and it needs to stay fun otherwise I'll get discouraged and not want to do it anymore. My mom works on quilts for her church to give to the needy, after talking to her last night, I had an idea, I should start a group that loom knits hats, mittens, gloves, scarves, socks, etc. during the winter months. It is so bitterly cold outside right now, I know there are many who are very cold and in need. I am aware of some loom knitters in my area, I should design a poster and put it up around town and see if I get any interested in doing something like this. I've started my project over (almost). I ran into the problem of my hand piece being either too big or too small for my hand (grrrrrrr). I have resorted to making a flat piece on the loom that created the hand piece too large and reducing it by four pegs. I will need to mattress stitch the piece together to create a tube. Hopefully this tube will fit my hand and I can finally finish my glove! I learned the mock crochet stitch the other day. What a fun, fun stitch!!! I am anxious to apply this stitch to a project (it would be lovely in a shawl, vest, hat, or purse). I used worsted weight yarn to learn, but think I'll use a much lighter yarn to complete a shawl or perhaps one of those neat belts that can pull out into a shawl I saw in the stores (my eldest stepdaughter said she wanted one of those). Fun! Click here for a demonstration from Isela (thanks again Isela -- still can't wait to get your book!). 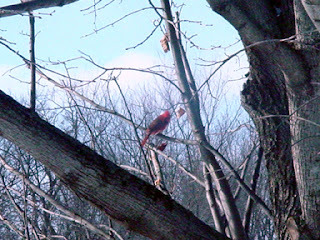 There is a cardinal out on the birdfeeder outside my livingroom window. What a beautiful bird! 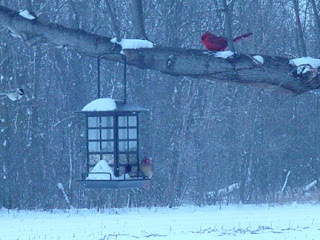 It is so bitterly cold outside (-15 below zero) and I wonder if that is why he stopped by. There's hope for (loom) newbies everywhere! I am working on a design (pretty scary since I am very much a newbie at this loom knitting stuff). It's actually turning out really well. It's a glove (with fingers -- I hate fingerless gloves). I looked all over the web and in my craft store for a pattern and all I found were fingerless ones (arrrrrrrrrg). I found patterns that I didn't understand with my limited knowledge of needle knitting, but no loom patterns (I can actually understand those). 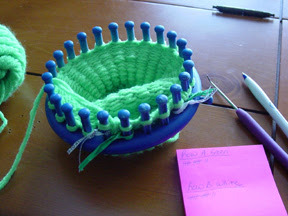 I do hope I am able to get this project put together so I can share something with my loom knitting groups (finally). There is hope for me yet! Once I am done, and if it turns out, I'll post some pics. Bittersweet goodbyes...from baby to toddler and she'll never look back. My youngest is now a toddler. She has been taking short forays across the living room now for weeks. As of yesterday, she has now given up her knees (she was walking around the house on her knees -- talk about funny!) for her feet (yeah!). It's bittersweet goodbyes since she is my last one (my tubes were tied so I know this is so). It's babysteps for her and babysteps for me (I am learning many new things on my loom). Just as she stumbles and falls (ouch, she just fell this weekend and cut her eye open), I stumble with the loom. But, just as she gets back up and keeps on trying until she finally gets the hang of it, so will I. Many loom knitters started out this way -- stumbling and then finally mastering this craft. With the help of the loom knitting groups I belong to on Yahoo.com I am learning many new things and learning how to get past the things I am doing wrong. 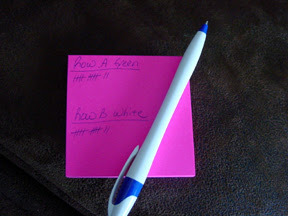 If you stumble across this blog and you are new to this craft, don't get discouraged! I have mastered some of the loom knitting basics and will eventually be able to accomplish my dream of knitting a toddler sweater!